Before I give you my 3 steps foolproof PMP® study plan, it is important to understand why we need it in the first place. I have been receiving questions related to PMP® study plan from a long time now. Sometimes, people who have already cleared their PMP® and are an active practitioner comes up with the suggestions of the PMP® study plan based on their experiences. Here, it is very important to understand that any one plan can be suitable for one person and this doesn’t guarantee that the other fellow can also have benefits from the same study plan. This means you cannot devise your study plan on the basis of any other individual’s personal experience without customizing it as per your requirements. Not all the books or study materials that have been successful for somebody else would be suitable to you. To set straight this confusion I have a 3 step simple approach to devise a PMP® study plan. Herein I have clearly set goals and activities apart since goal for all is one but one has to find their own activities to achieve it individually. Every individual is unique and activities are directly proportional to the learning approach of an individual. Phase End Criteria: It is mandatory to identify your phase end criteria i. e. how much you need to score. For our students we recommend them to score 60% + in Lesson End Quizzes.You are free to use quizzes from any book or study material available to you. Activities: this part of your study plan depends on what all material and resources are available to you i.e. what all activities you can perform to meet your goal. PMBOK® Guide Sixth Edition Go through the content provided by your trainer. If you are our client, watching chapter wise videos would double the speed of getting project management concepts. Reading Preparatory books like that of Headfirst/Rita/Andy. Reading and Following PMBOK® Guide Sixth Edition. After each course chapter, you can read relevant chapter from PMBOK®Guide Sixth Edition and attempt lesson end quizzes. Note: You are not required to go in deep in the details of Agile Practice Guide; a basic understanding is more than enough. It helps to understand how you can do better project management in an uncertain environment where things keep changing. PMI understands that response to a change in an uncertain environment is not industry-specific, and they integrated Agile concepts which are an excellent support to all professionals who are working in frequently changing environment. If you are aware of these concepts already, you can skip the content of this book during the Know phase. Study the details of each Knowledge area prescribed in PMBOK® Guide Sixth Edition. Phase End Criteria: Score 85% + in Each Knowledge Area Quizzes. Try at least 60 questions per knowledge area before moving ahead. You can again go through content of Agile Practice Guide for more clarity. Phase End Criteria: Score 80% + in expert simulation exams. Be cautious since this part is tricky and tends to confuse candidates and delay the certification too. Activities: Pick some reliable and good resource of question bank, practice 3 to 4 full length or 600 to 800 questions. It is very important to practice as many as questions possible but what is more important here is what you learn from one test with full concentration. I have seen many people taking umpteen numbers of tests just to ensure that they have prepared well. Learning can be possible even with fewer tests too. At any point, if something is not clear, come to the forum. With 2000+ of active threads. This can also be treated as a learning source, as almost all possible questions have been discussed here. You can search for your doubts, and if needed you can post your questions as well. Interaction and participation in our forum are available to all PMP aspirants irrespective of you enrolled in our course or not. Also live interactive doubt clarification session support is also available to our clients, because we understand the need of continuous interactive discussion till you get certified. If you wish to speed up your PMP® Certification journey do consider enrolling in our PMP® Online training program. iZenBridge offers a highly advanced and integrated online program which suite well to working professionals. It is effective to understand and to recollect concepts whenever any gap identified especially while going through practice and mock questions. 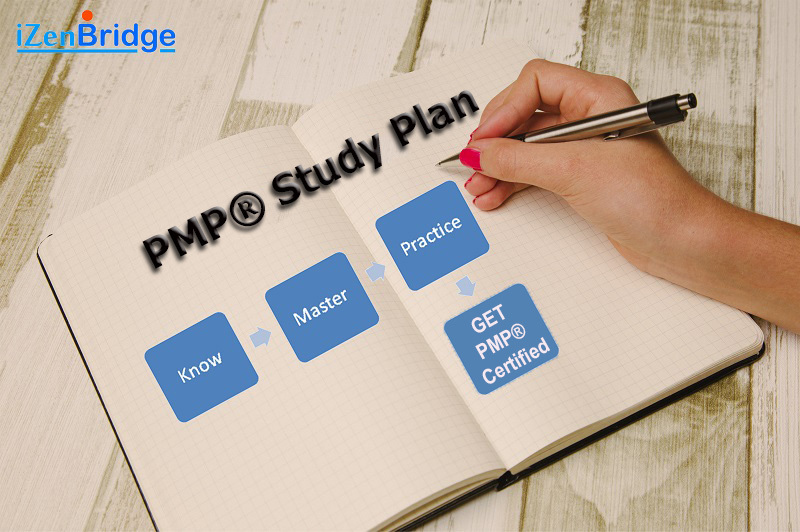 Do let me know if you have any follow up query on PMP® Study plan, I will be happy to assist. Nice Blog. The Project Management Institute (PMI) has published a ‘Handbook’ with credentials. This handbook explains all the information that is required to know before anyone embark upon the journey of taking PMP exam and become PMI certified Project Manager. Reading the Handbook takes 20-25 minutes. This must be first 20 minutes on your journey to become PMP Certified! Thanks for sharing the PMP Study Plan..